Honey Gold from East Pacific Tea Co.
Travel far away to the Fujian Province of China. Our Honey Gold Tea steeps a nice amber color and releases a captivating orchid scent. Serves great chilled, and will impress any connoisseur. Just as the description above suggests, the aroma is indeed captivating with its flowery notes. I can also detect a somewhat woody fragrance to it, with notes of earth lingering in the background. The sip begins with a woody flavor – oak, perhaps? – and finishes with a sweet, honey-esque smoothness. There are faint hints of smoke that weave in and out throughout the sip, and a stronger fruit note that is somewhat peach-like. There is also the slightest whisper of flower in the sip that reminds me of the air in my gramma’s backyard when the honeysuckles were in bloom. I have come to expect exceptional quality when it comes to East Pacific Tea Company and this Oolong is certainly exceptional. The flavor is deliciously complex and contemplative, with an aroma that enchants the spirit. 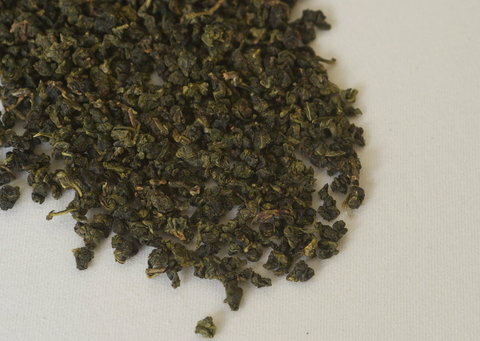 And the best part when it comes to East Pacific Tea’s high-quality Oolong teas? They product multiple infusions – stretching the value of this fine tea. What a delight! 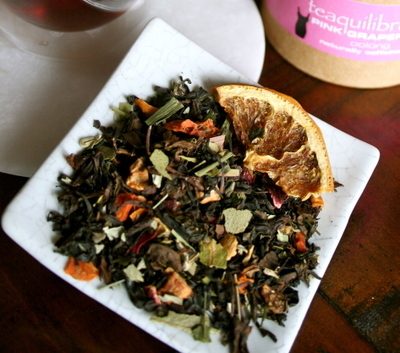 Teaquilibrium’s Pink Grapefruit is bold refreshing. The colorful combination of citrus and eucalyptus make LBD Pink Grapefruit delicious iced. ingredients: oolong tea, apple pieces, carrot flakes, blackberry leaves, eucalyptus leaves, beetroot, hibiscus, lemon grass, natural flavor, freeze-dried tangerine pieces, orange slices. I’m really liking this blend! After reading through the ingredients, I was a little worried about the combination of hibiscus and Oolong tea, I worried that the somewhat thick, syrupy nature of the hibiscus might interfere with the lovely texture of the Oolong, but, that didn’t happen here. The hibiscus seems to do very little in this blend – thankfully – except for adding some color and perhaps a little tartness. But the tartness in this case is quite welcome, because it compliments the tangy citrus flavors so well. Even though there are several different components to this tea that contribute a citrus flavor, the dominant flavor is that of pink grapefruit. It is tart yet sweet and quite juicy tasting. At first, I didn’t taste much of the eucalyptus in this, but as I continue to sip, I notice it slightly more. It is still rather subtle. It does add some definition to the grapefruit flavor, but, this definitely doesn’t taste like eucalyptus. It tastes like grapefruit! The Oolong flavor, by comparison, is a little muted. Ordinarily, I might find fault with that, however, this is so remarkably tasty that its difficult to complain about the lack of Oolong taste. This is definitely more of a tea for grapefruit lovers than it is for Oolong lovers, although Oolong lovers might find this a welcome departure from the usual. Overall, I really enjoyed this cup. Such a pleasant flavor that I find to be quite invigorating. It has a very pleasing natural sweetness to it, so little to no additional sweetener is required, which is perfect for those of us who are trying to cut back on the sugar intake! A great tea for an afternoon out with girlfriends! Cinnabar, or Rou Gui in Chinese, is another of our fine mother tree cliff teas. The long-lasting aroma of this tea has hints of exotic spices and scents from the depths of a honeycomb. The energy of Cinnabar is deep and penetrating and this tea can stand alone or be consumed after another enhancing the overall chi effect. This tea was hand picked, processed and packaged contributing to this intense energy. Like our other mother tree cliff teas, once our stock of this is gone, it may be gone for good! Wow! This Oolong is SO good! 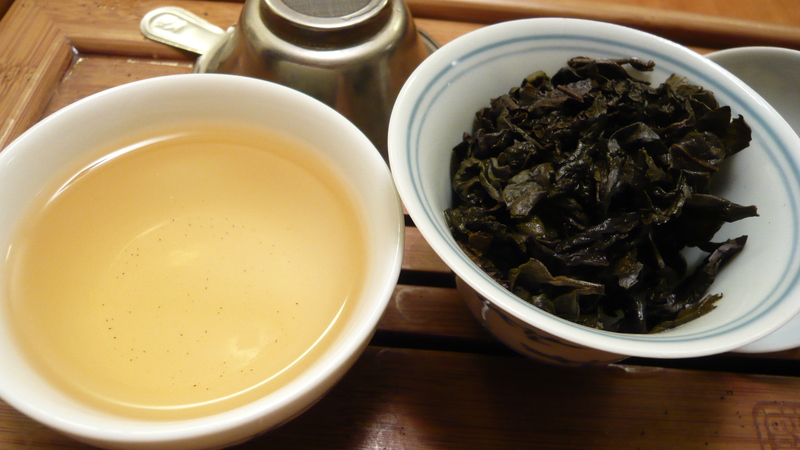 It is so different from any other Oolong I’ve tried. I attribute the difference to the fact that this is a “cliff tea.” I wasn’t too sure what that meant, so I visited the Cloudwalker Teas website to learn more. This tea is grown in on the Wu Yi Mountain and is hand roasted. Due to the processing and care that is put into this tea, it is exceptionally rare. It is also exceptionally delicious! The first thing I noticed about this tea is a profound spice tone to the cup. It has a very exotic taste to it, like it’s been seasoned with the essence of warm spice (but it hasn’t!) The next thing I notice is a deep sweetness to it, which is contrasted sharply with a sour note. The complexity of this tea excites and invigorates the palate. When I visited the Cloudwalker Teas website, I noticed that this tea is currently sold out. I do recommend visiting the website regularly to learn when it might be back in stock, because this one is well worth the extra effort to obtain! It’s one of those rare gems that you’ll want in your tea cupboard! Traditional charcoal roast with Tie Guan Yin and Mao Xie. I adore Oolong teas, and this Tie Guan Yin is superb! The leaves are dark, a result of charcoal roasting. 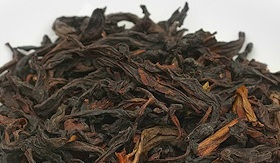 The roasting has imparted a delicious toasty flavor to the natural nutty tones of the Oolong. 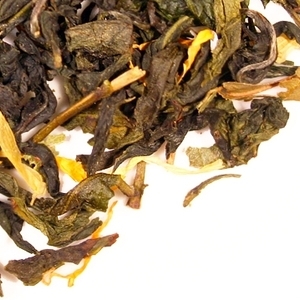 The buttery flavor that is often a part of Oolong has become more of a caramel sweetness. It’s almost like a dessert in a teacup! The sip starts with with an introduction of the sweet yet savory roasted nut flavor which soon gives way to a hint of flower (almost honeysuckle-esque). The caramel notes sit in the background, never becoming too prominent or overwhelming. The mouthfeel here is light, much lighter than a very green Oolong would be, and not nearly as creamy. A whisper of smoke weaves its way throughout the sip and remains through the aftertaste. Overall the tea is bittersweet with the emphasis on sweet rather than on bitter. There is a moderate amount of cleansing astringency at the finish. In subsequent infusions, I noticed that the smoky flavor came through a little more – but it was never an overpowering presence. 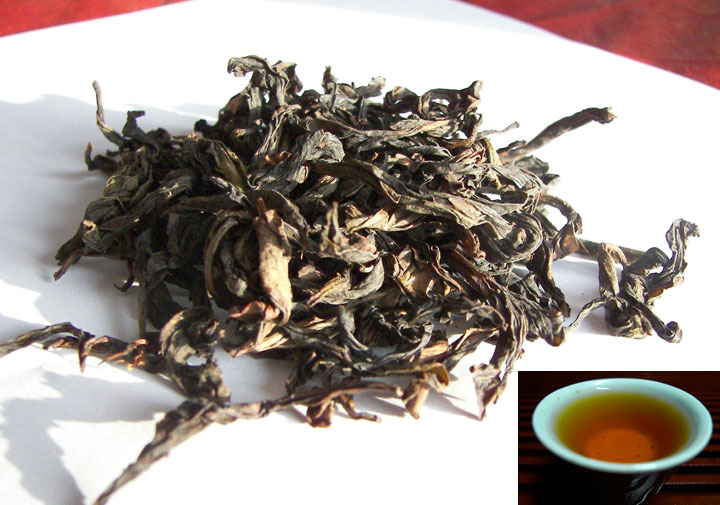 It’s absolutely delicious and a must try for Oolong enthusiasts. I agree. While some teas can be extraordinarily expensive, I like it when I find a company that offers delicious, high quality teas at an affordable price, such as Life in Teacup! Seriously…who ever came up with Mandarin Silk over at The Persimmon Tree Tea Company is PURE GENIUS! 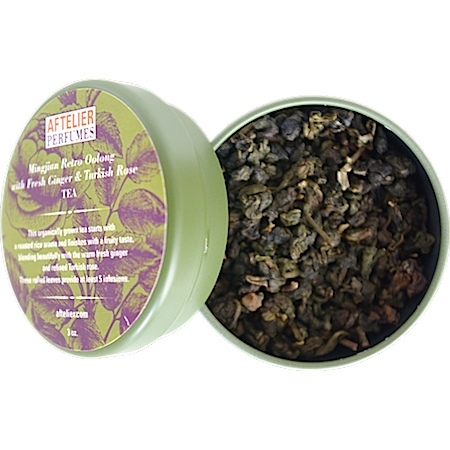 This flavored Oolong is an Awesome Pouchong – Marvy Myrtle – Smooth Vanilla – Citrus Finish – Incredible Aroma – Silky Smooth…mouth watering MASTER PIECE! The flavor combo couldn’t be more perfect! It has many of my favorites all wrapped-up into one amazing flavored tea! This tea will forever have a place in my upper 90’s personal rating scale! If any or all of these flavors intrigue you – you won’t want to miss this tea from The Persimmon Tree Tea Company! I’ve said before and I will say it again…The Persimmon Tree Tea Company is one of those companies that I can see myself placing multiple orders thru and their selection of creative flavor combinations cannot be matched! I really like this company and I adore this tea from them!! !